Andre Perry (he/him) is a David M. Rubenstein Fellow in the Metropolitan Policy Program at the Brookings Institution. His research focuses on race and structural inequality, education, and economic inclusion. His experience includes a range of leadership roles across sectors such as having been a founding dean, professor, award-winning journalist, and activist in the field of education. Andre served on the education teams for Lousiana Governor-elect John Bel Edward and New Orleans Mayor-elect Mitch Landrieu. 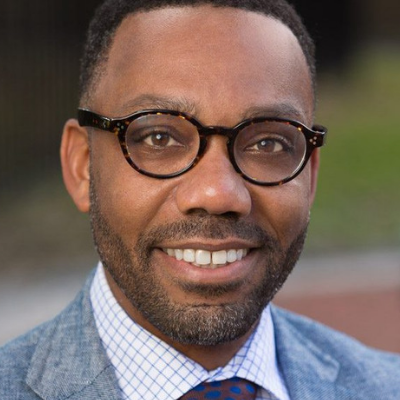 Previously, Andre was a founder of the College of Urban Education at Davenport University, chief executive officer of the Capital One-University of New Orleans Charter Network, and an associate professor of educational leadership at the University of New Orleans. He earned his Ph.D. in education policy and leadership from the University of Maryland College Park. Andre is a native of Pittsburgh, PA and lives in the Washington, DC area.